A week has passed since 36 people, ranging from 17 to 61 years old, perished in a devastating fire during an East Oakland warehouse party. How did the fire start? Why were people able to live in the warehouse illegally? Why wasn’t the building red-tagged by code enforcement officers? On Friday, people held vigils not only to honor the lives lost, but also to call for change to make sure such a deadly incident doesn’t happen again. An Aztec ritual kicked off a memorial service on Friday, with councilman Noel Gallo leading the way. 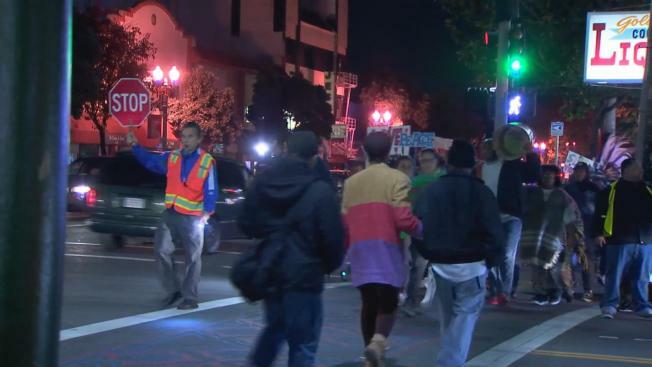 Gallo holds a march in the Fruitvale district every week, but this one took on a whole new meaning in the wake of last week’s destructive blaze. The councilman said he doesn’t want to see another warehouse tragedy on his watch, so he is demanding answers from the city of Oakland. “How many code enforcement individuals do we have? How many fire marshals do we have?” he asked. Gallo said the city was looking at hiring people to fill positions within the Fire Department to inspect places like the Ghost Ship warehouse – but it was put on the back burner. While city leaders look for answers as to why the warehouse lacked fire alarms, sprinklers and emergency exits, a community took to the streets on Friday and ended their vigil at the site of the burned down building with testimony and prayer. Their anguish was mirrored across Oakland as hundreds gathered to grieve for the 36 victims. There were songs, a moment of silence, and even bubbles to represent tiny prayers and thoughts of lives lost. “I don’t know that there’s anyone here who didn’t know someone who died in the fire. We had several people there, but most of them got out,” said Oakland Museum Director Lori Fogarty. However, one did not. Alex Ghassan, whose videos were part of an exhibition that ended six weeks ago. On Friday, an installation shared insights about each victim. Katie Villanueva brought her family from El Sobrante and folded paper cranes in their memory. “I think it’s a beautiful thing that Oakland is coming together like this,” she said. Meanwhile, at Oakland’s First Congregation Church, the Pacific Boychoir Academy dedicated its performance to one of its own – 17-year-old Draven Mcgill, who died in the fire.